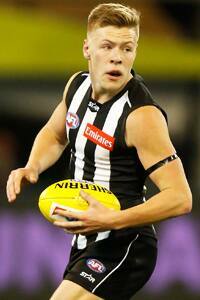 Jordan De Goey walked away from his first Copeland Trophy night with victory in the Harry Collier Trophy. This time last year, Jordan De Goey was clubless. He had completed a stellar season at the Oakleigh Chargers and had more recently strutted his stuff in front of all 18 AFL clubs at the National Draft Combine at Etihad Stadium. Yet in football circles he was in the wilderness, not knowing where he would be living and what colours he would be wearing the following year. 12 months later and after 16 games in his debut season, De Goey has been awarded the Harry Collier Trophy for the Magpies best first year player. The 19-year-old midfielder wasted no time settling into his time in the black and white stripes. After a solid preseason and an eye-catching NAB Cup, it was clear that De Goey would quickly find his place amongst the Collingwood midfield. In a similar nature to 2014 Harry Collier Trophy winner Tom Langdon, Nathan Buckley handed De Goey his debut in the first round of the home and away season as the Magpies flew to Brisbane to take on the Lions. However while Langdon cemented his place in the AFL side until round 14 last year, De Goey was forced start his career in a more stagnant fashion after returning to the VFL in round two. After five games with the VFL Magpies he returned to the fold in time for Collingwood’s round seven blockbuster with Richmond on a sunny Sunday afternoon at the MCG. 11 consecutive games followed as De Goey established himself as a reliable, highly-skilled onballer. He was recognised with a nomination for the AFL NAB Rising Star award in round 20 after a games which consisted of 18 disposals, 12 tackles and a goal. While this could have easily been the pinnacle of De Goey’s season, two weeks later he went one better. With captain Scott Pendlebury experimenting with a new role in defence, De Goey stepped into the captains shoes with a career-high 25 disposals to go with 10 clearances. 20 years ago, a blond-haired midfielder in Scott Burns walked onto the podium on Copeland Trophy night and claimed the Harry Collier Trophy for best first year player. After a debut season to remember, the similarities between De Goey and Burns may extend beyond their field position and hair colour.